The Pazo de Valdomiño distillery has become a benchmark in terms of development and distinction of spirits and traditional liqueurs in Galicia. A careful selction of prime, raw material, quality and design are blended to give a range of products their unique flavour. Located in the O Rosal valley, at the mouth of the River Mino, known for its ideal microclimate for the wine industry, the distillery is known for obtaining liqueur from the Albariño grape pomace and other varieties. In addition, a precise combination of herbs, fruits and coffee, where appropriate, make each product liqueur sublime,of a distinct colour and flavour, digestive and highly valued in our rich and varied gastronomy. The modern facilities define the character of a distillery whose main objective is the recognition and appreciation of quality distillate for the most discerning palates. The products are certified by the Regulating Council of Traditional Spirits and Liqueurs of Galicia. 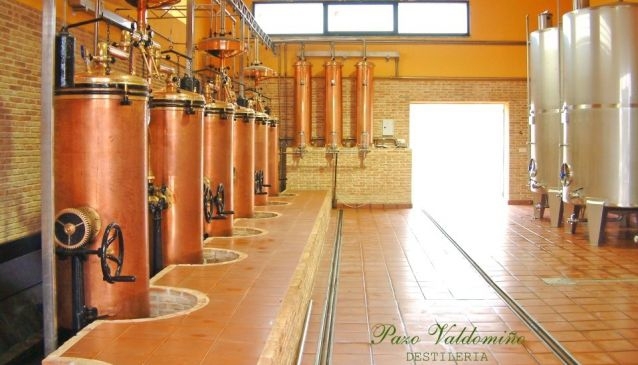 The range of Pazo de Valdomiño Premium products is in the highest selection of distillates not only because of its high quality but also because of its innovative, unique and personalized design.To the most traditional elaboration, a novel column for reducing methanol content is included. As a result, a clean and crystalline aguardiente is obtained, with much more complexity and aromatic elegance due to its triple distillation. With this new design comes one of the most important decisions taken by the distillery as far as creation, projection and selection is concerned : Aguardiente of Orujo, Aged Aguardiente, Herbal Liqueur, Coffee Liqueur and Cilantro Liqueur noteworthy for their high quality, are presented in a new, unique and personalized bottle in exquisite form reflecting the elegance and grandeur of its contents. Cilantro is the star product,a herbal liqueur which is aromatic and medicinal so is unique in the world, prepared using an ancient recipe introduced in 1877 by Manuel Ozores from Goián and transmitted, since then, over generations.Recognized as originating from the village of Goián in Baixo Miño (Pontevedra),it has become appreciated in the local gastronomy due to the distinct characteristics in terms of aroma, colour and taste that gives the maceration of coriander seeds and other herbs in Aguardiente of Orujo.The distillery Valdomiño has undertook to continue this family tradition and respect, adapting to changing times and developed with the same love and care for this unique and sublime liqueur.